Type specimen: Watt 5419 resides at Royal Botanic Garden Edinburgh (specimens E00024518, E00024519, E00024520) and KEW (specimen K000750279). Epithet: Named for Dr. J. Stirton. Distribution: Nepal, Bhutan, Sikkim, Arunachal Pradesh. First collected on the Surkia La, near the Kang La on the Nepal-Sikkim border. This is a very small species, no more than 3cm tall with spathulate leaves, incised-dentate in the upper margin, and scabrid on both surfaces. 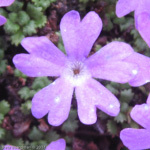 The flowers are blue-purple with a white eye, exannulate, a few hairs in the throat and emarginate lobes. Compare with related species P. waddellii and P. muscoides. If you have an image of this species, please contact the webmaster.